Be the first to share your favorite memory, photo or story of Anita. This memorial page is dedicated for family, friends and future generations to celebrate the life of their loved one. 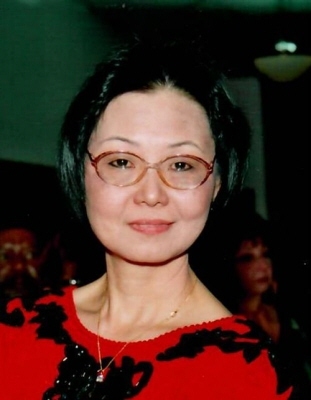 Everett - Anita Chan-Bovio passed on January 27th 2019, surrounded by loved ones. Anita is survived by her loving husband, Peter Bovio; her mother Lai Cheung Chan; her brothers Alan, David, Leo, Peter, John; her sister Ann; and her nephews and nieces Anson, Alicia, Brian, Chris, Ryan, Daniel, and Jordan. Anita’s journey has brought her from a small village in Hong Kong, to Rhode Island and California, before she settled in her home in Everett. In every place she went and every life she touched, she was a pillar of strength for her loved ones and her community. Many know her as the face and founder of Tasty Garden Restaurant in Everett for nearly 30 years. Others may know her for her tireless contributions and support for the local community. As a Buddhist and member of Soka Gokai International in Brookline, Anita lived her life on the foundation of a great principle; to be strong and help support those around us. If you were tired she would offer you her chair; if you were hungry, she would offer you the food on her plate; if you were poor, she would give you the money in her pocket. Anita has traveled far and impacted many lives along the way, but her journey does not end with her passing. She will be memorialized in a private ceremony with immediate family. In lieu of tears, Anita would ask you to stand powerfully and support those around you. In lieu of flowers, she would ask you to create a positive impact for another. Please send donations to a foundation of your choice in her name. Her funeral services will be private. Arrangements by the Campbell Funeral Home, 525 Cabot Street, Beverly. Online condolences at www.campbellfuneral.com . "Email Address" would like to share the life celebration of Anita Mai Bovio. Click on the "link" to go to share a favorite memory or leave a condolence message for the family.